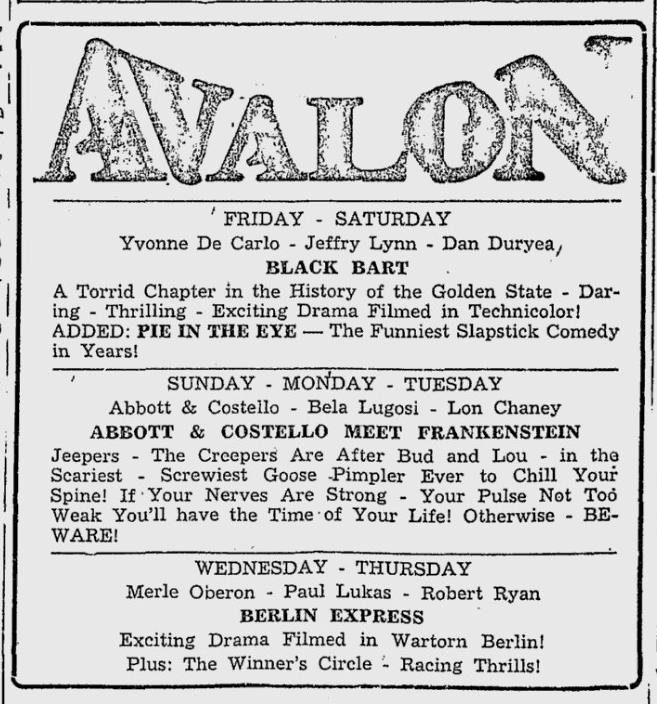 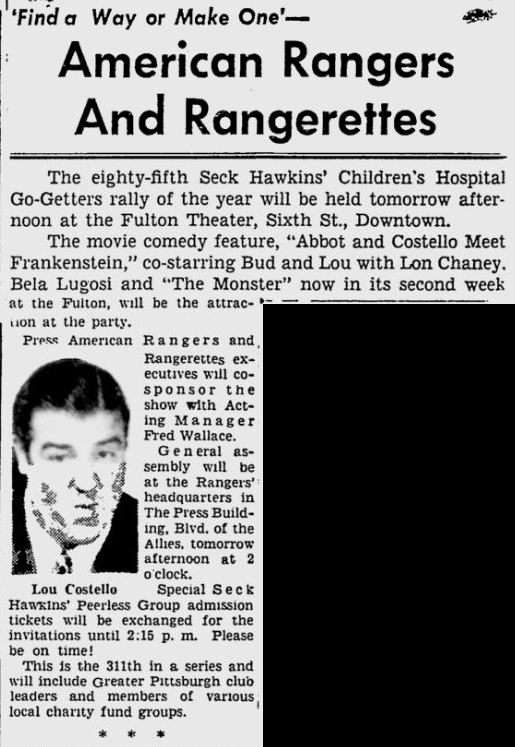 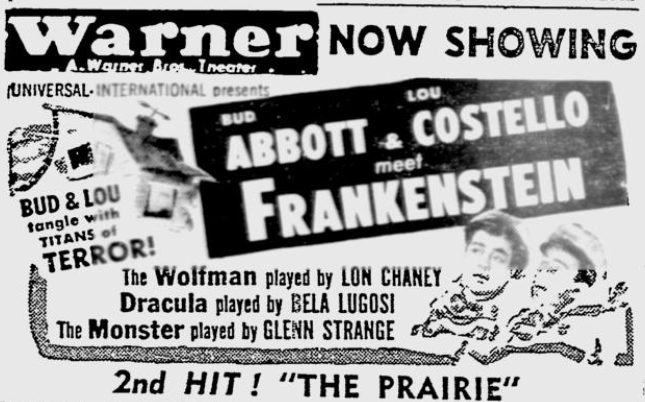 Hollywood, Feb. 28—(INS)—The king of screen goons, Lon Chaney, Jr., plans to invest some of his own money in his next horror pictures. 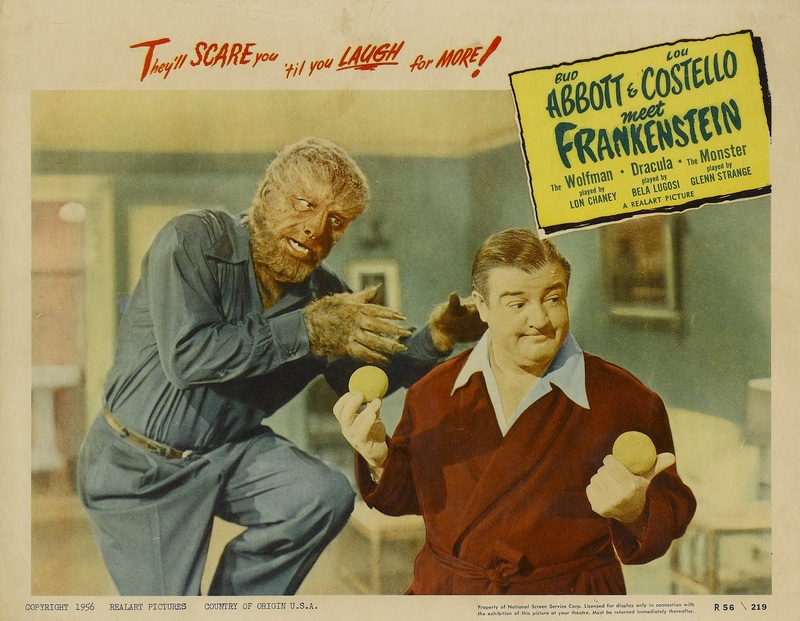 What’s more, he’s thought up two new fiendish delights to scare the wits out of his fans. 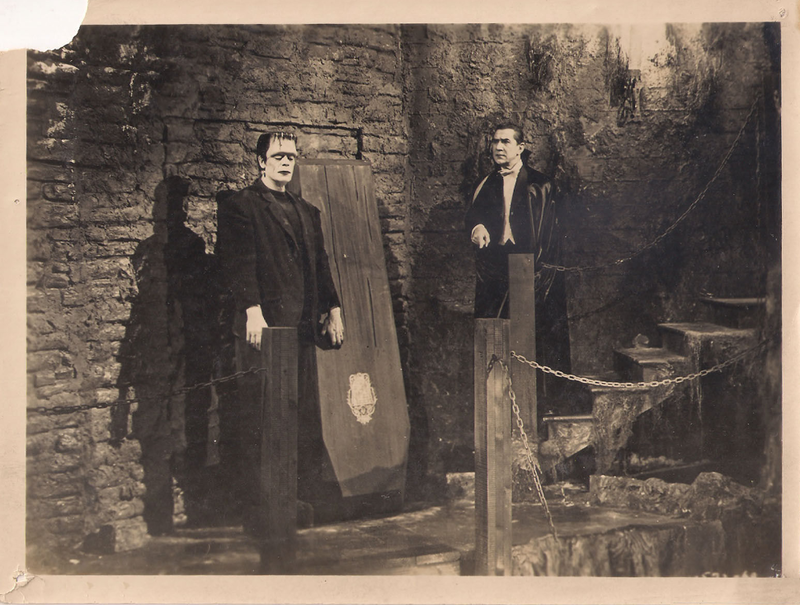 He isn’t saying yet what form the new monsters will take, but he ought to know what he’s doing. 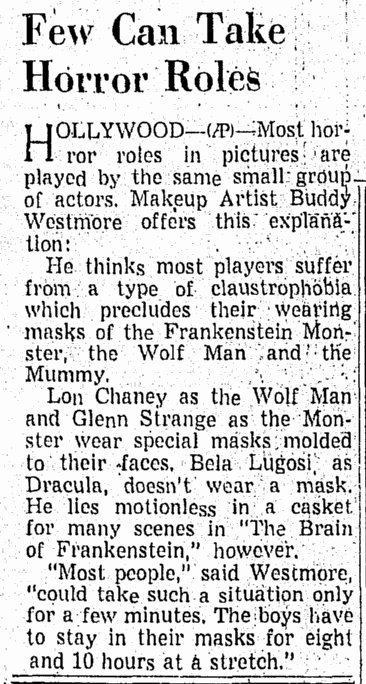 Lon is the only goon man who has played them all, Wolf Man, Frankenstein’s Monster, Dracula, the Mummy and all the rest. 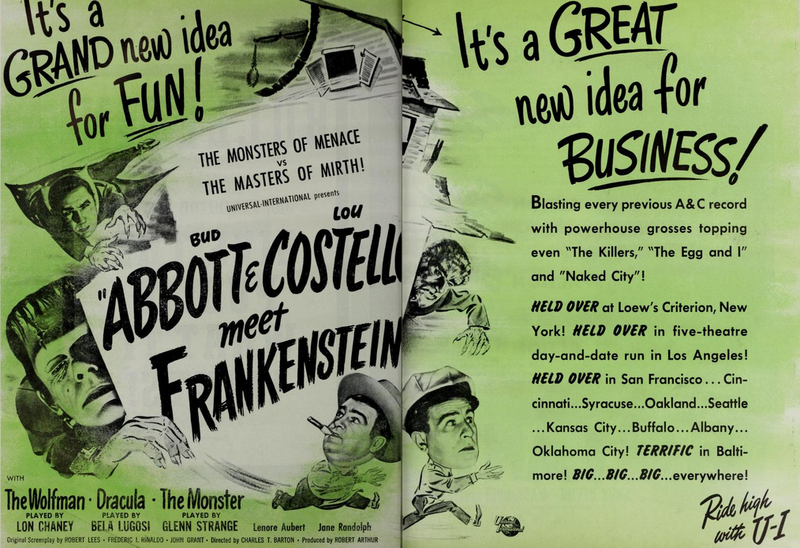 I talked to Lon at Universal-International. 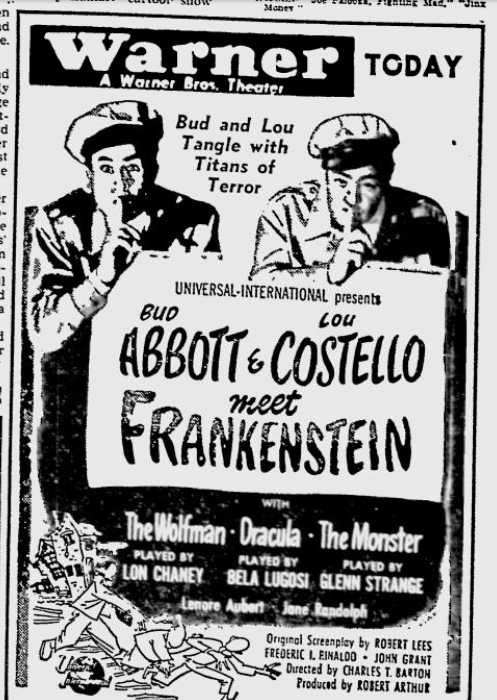 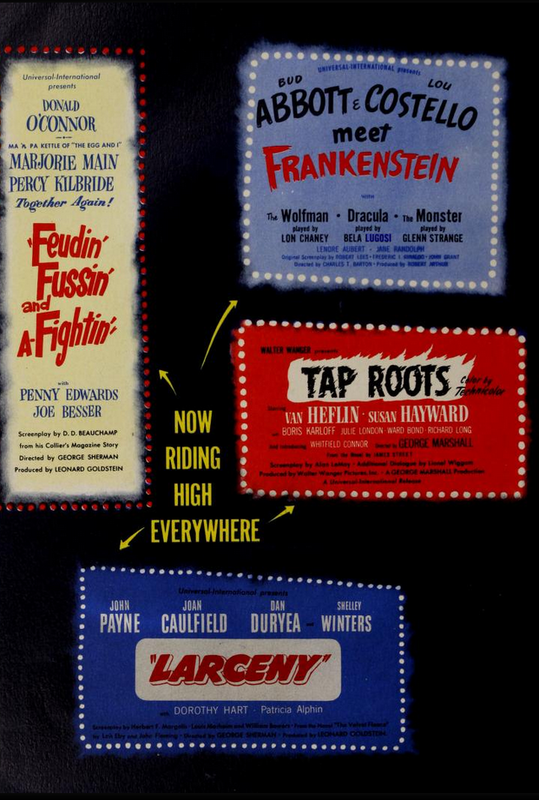 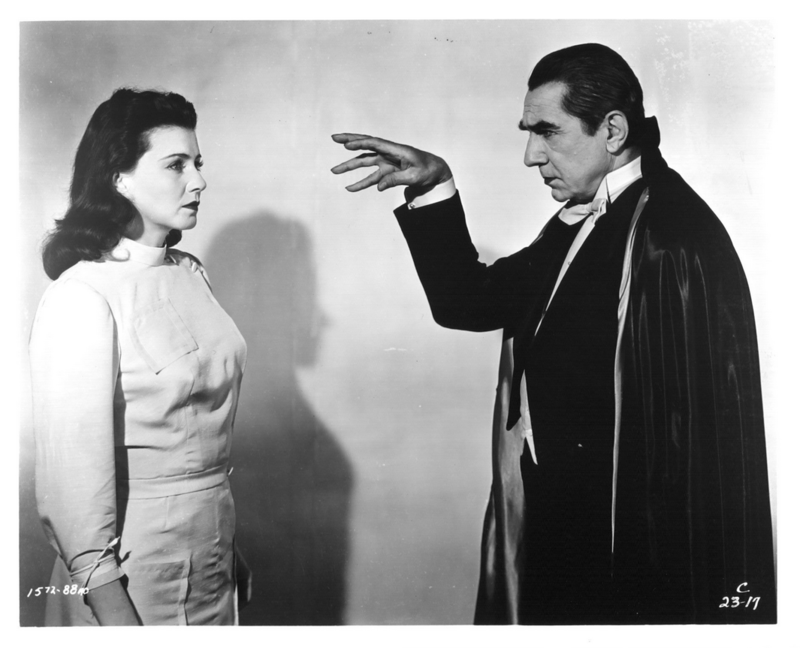 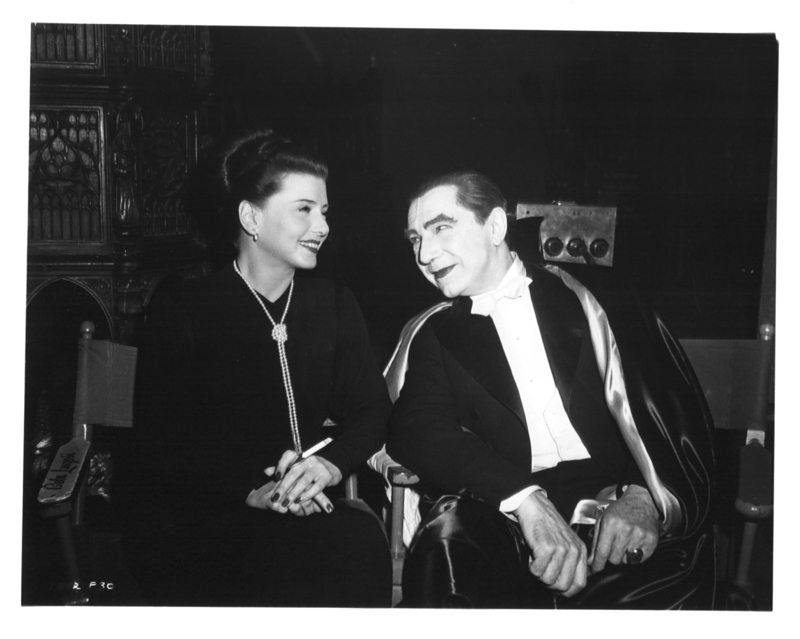 He’s currently playing The Wolf Man in Brain of Frankenstein, which is a combination horror and comedy, what with Abbott & Costello, Bela Lugosi as Dracula and Glenn Strange as Frankenstein’s Monster. 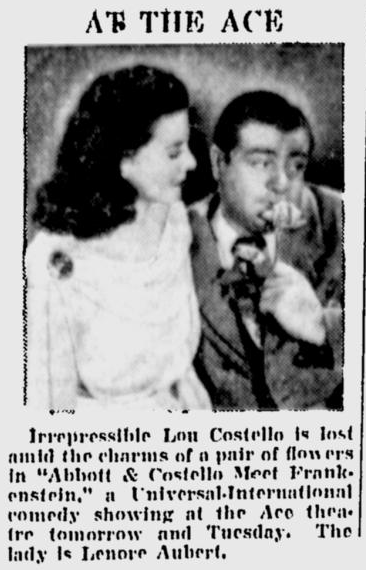 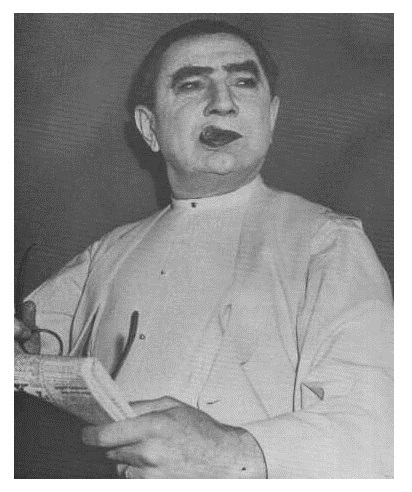 Lon conceded that the good make-ups are tough on a man. 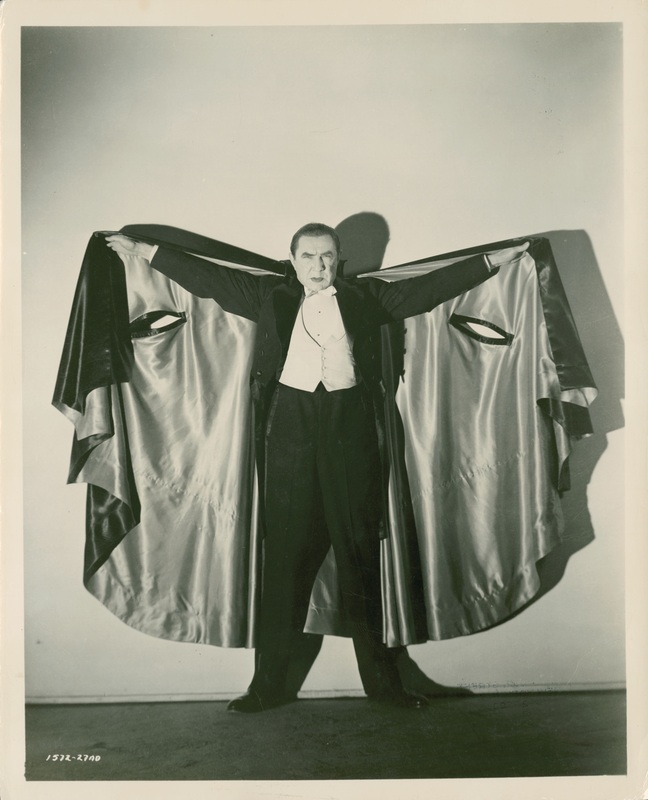 “I have a new Wolf Man outfit which I can get on in two hours, which is a big break,” he said, “Up to this picture it used to take me six hours. 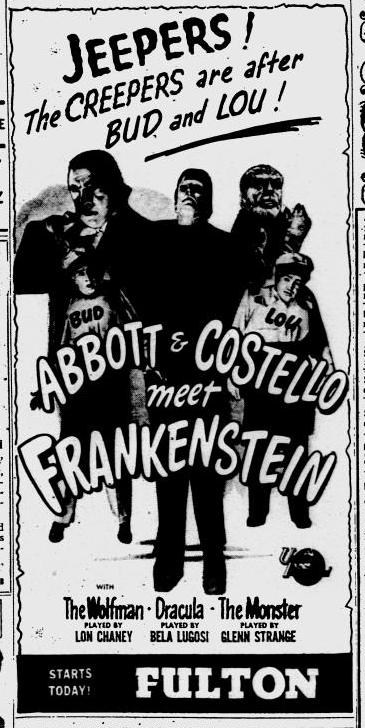 I’d have to get to the studio at 3 am. 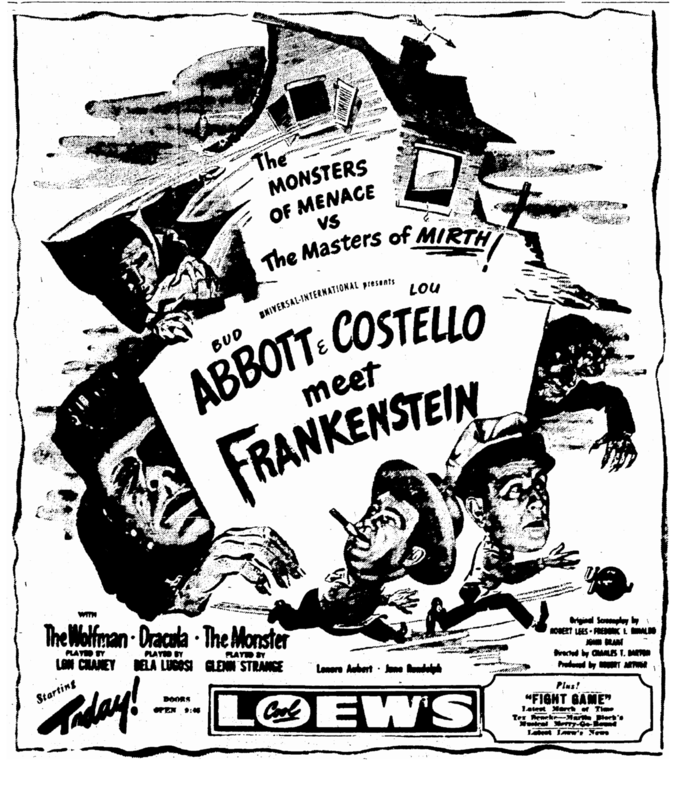 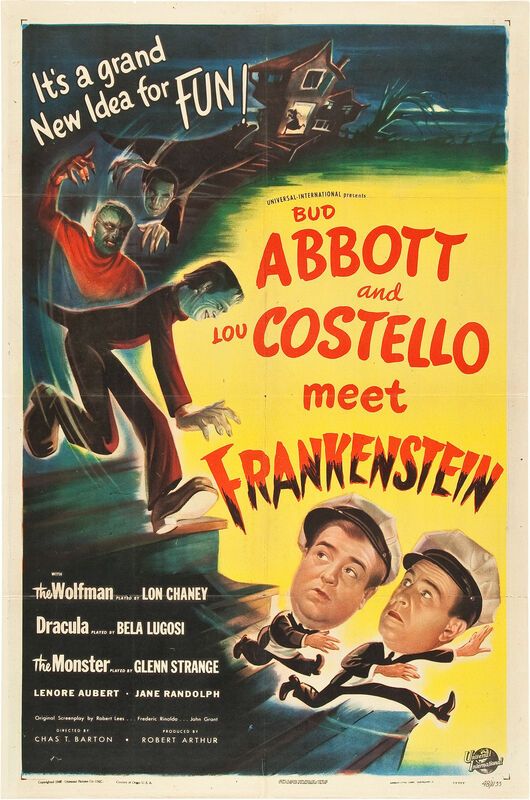 Most of the comic invention in “Abbott and Costello Meet Frankenstein” is embraced in the idea and the title. 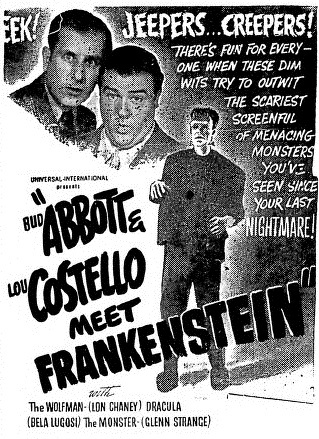 The notion of having these two clowns run afoul of the famous screen monster is a good laugh in itself. 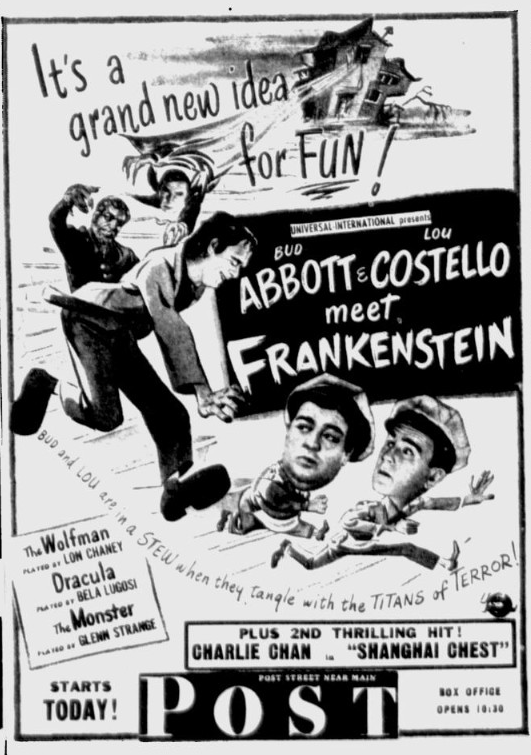 But take this gentle warning: get the most out of that one laugh while you can, because the picture, at Loew’s Criterion, does not contain many more. 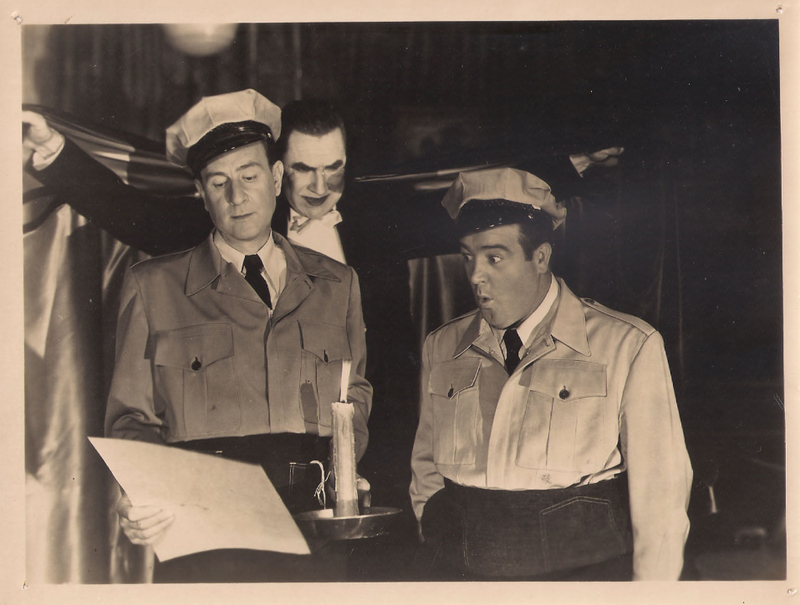 That is to say, the situations which the wags at Universal have contrived for their two untiring comedians in this assembly-line comedy are the obvious complications that would occur in a house of horrors. 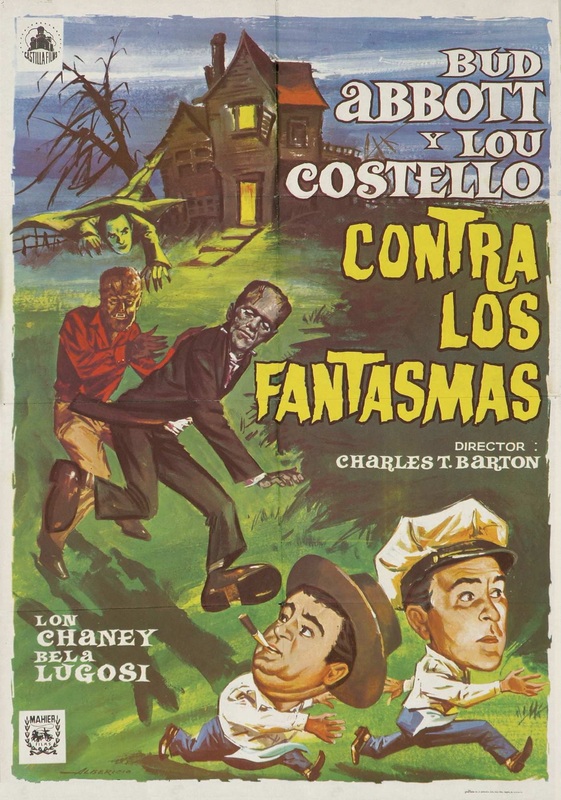 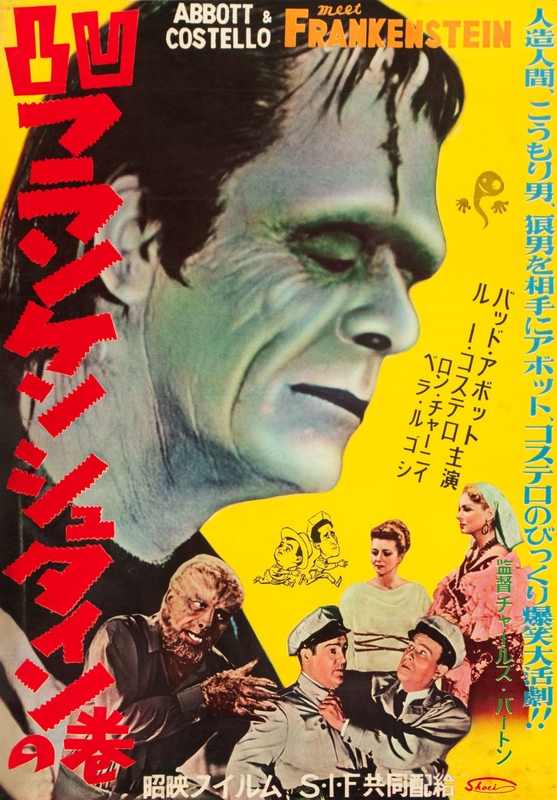 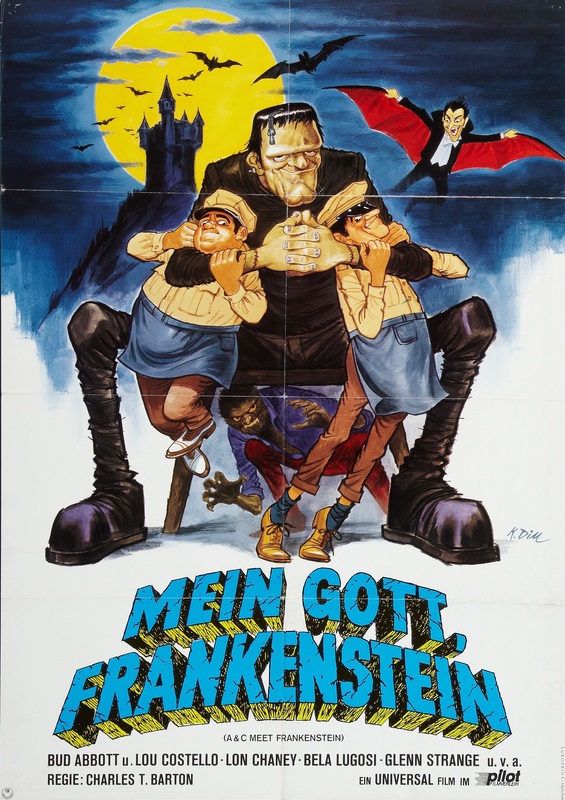 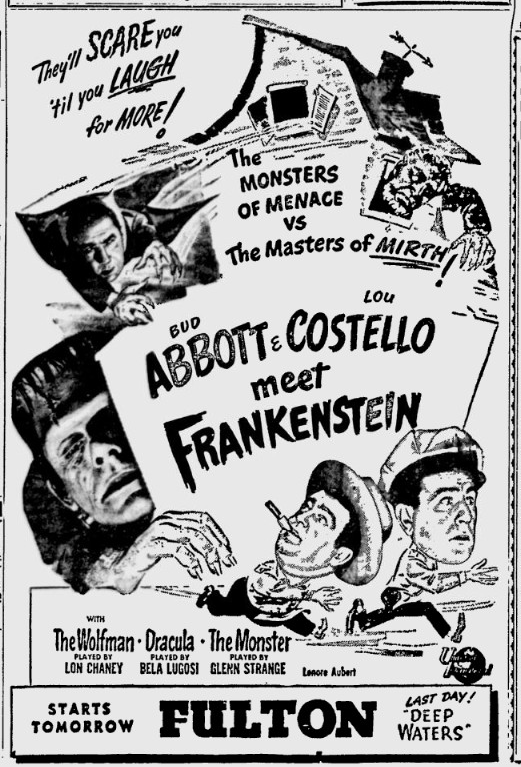 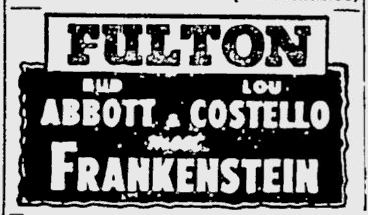 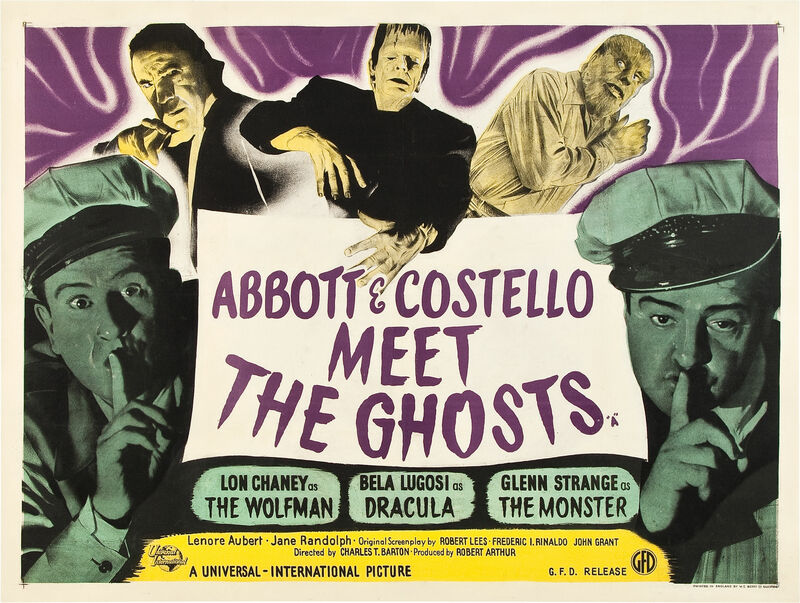 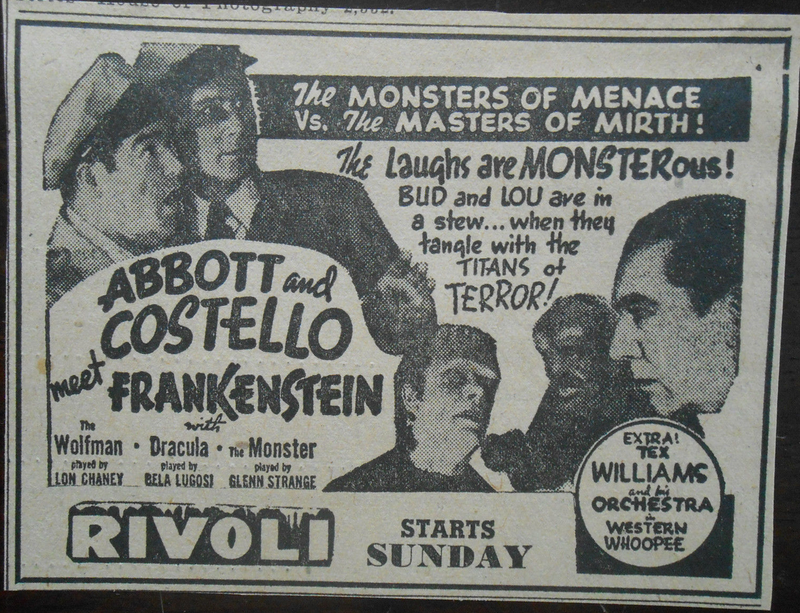 Costello, the roly-poly and completely susceptible one, shudders and shakes in standard terror to behold the assembly of ghouls—which includes not only the monster but Count Dracula and the Wolfman. 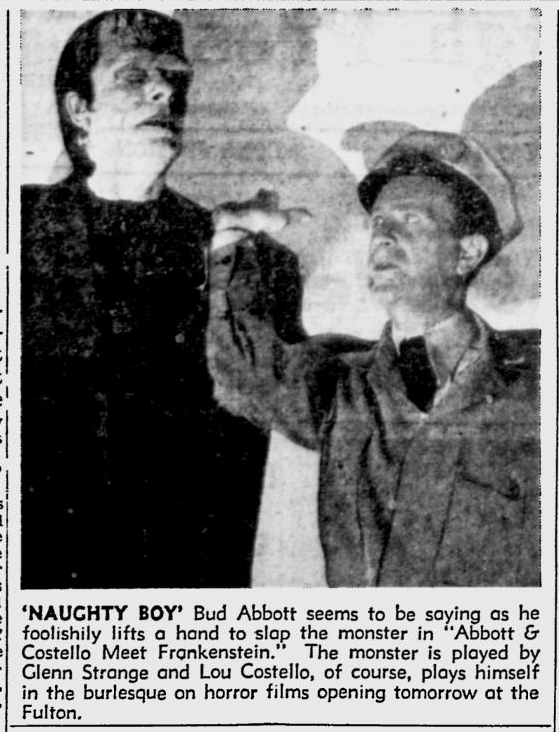 Abbott, prevented from seeing the creatures until near the end, scoffs and snorts at his partner from behaving so curiously. 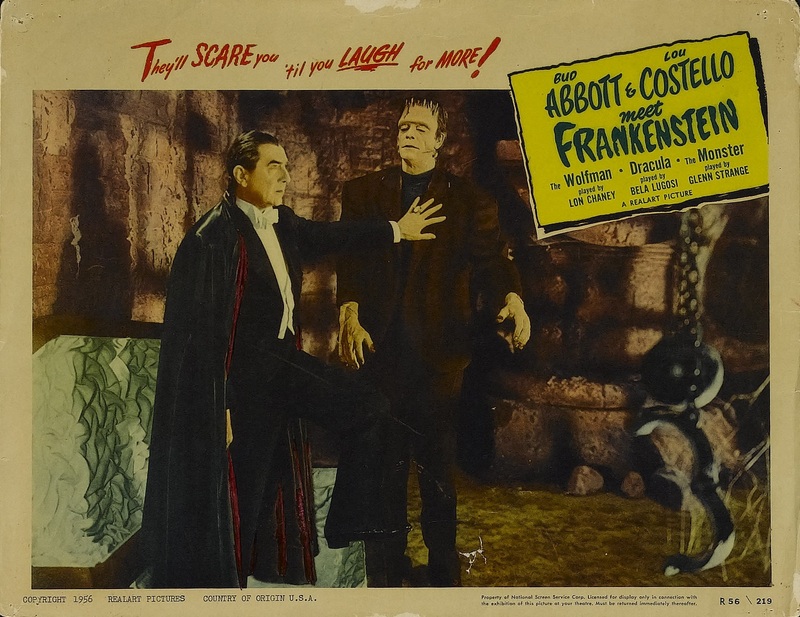 After a thorough exhaustion of this play on frustration and fright, the story is brought to a climax with the intended transference of a brain. 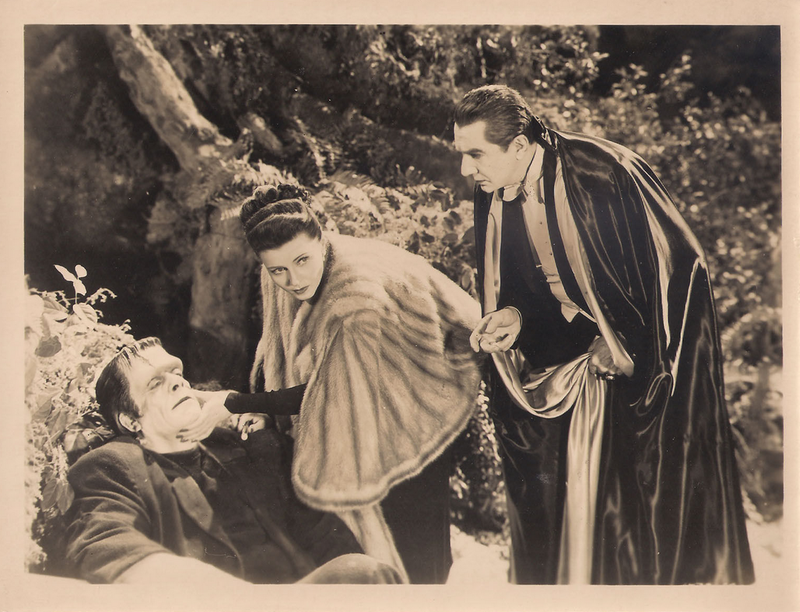 Whose brain is tagged for what monster we leave you to surmise. 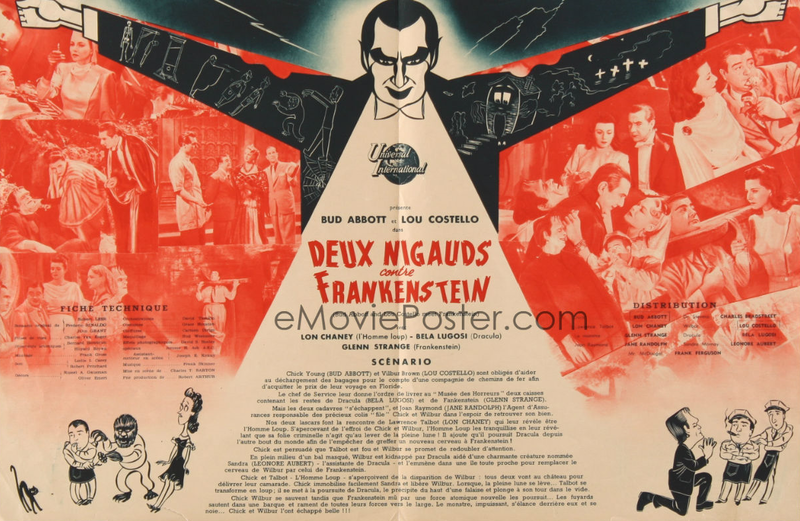 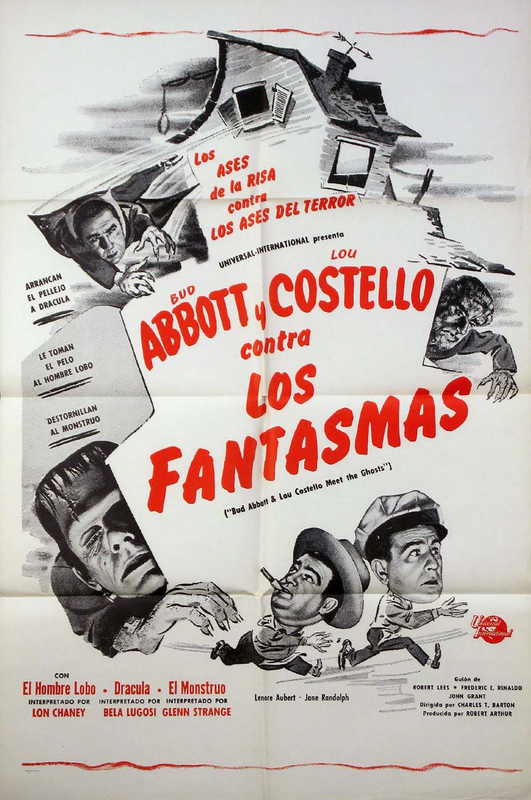 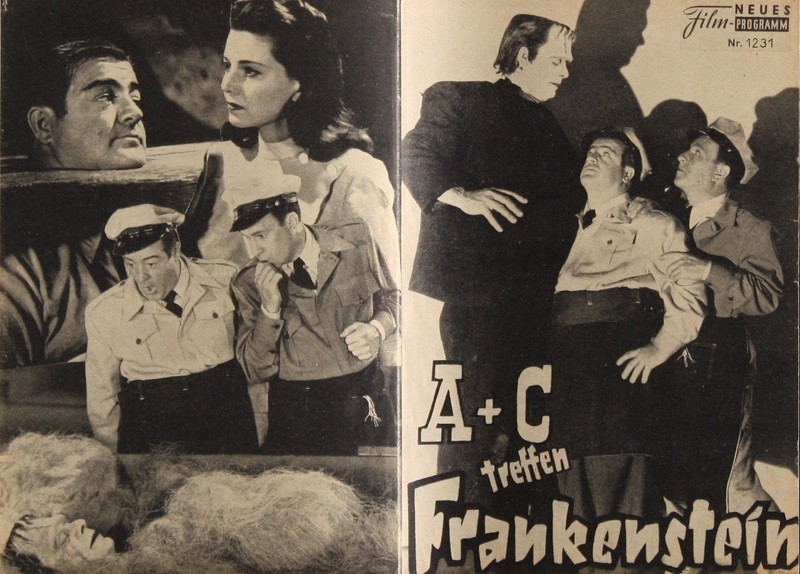 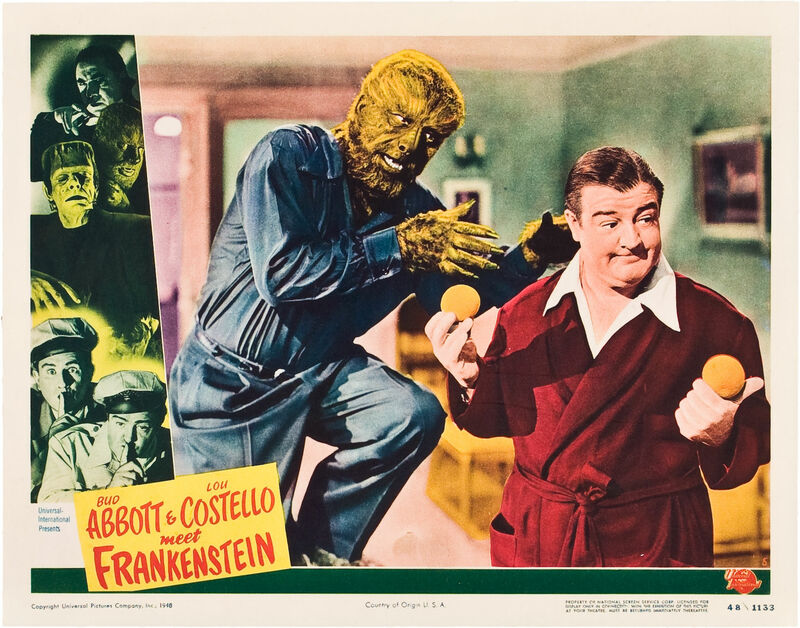 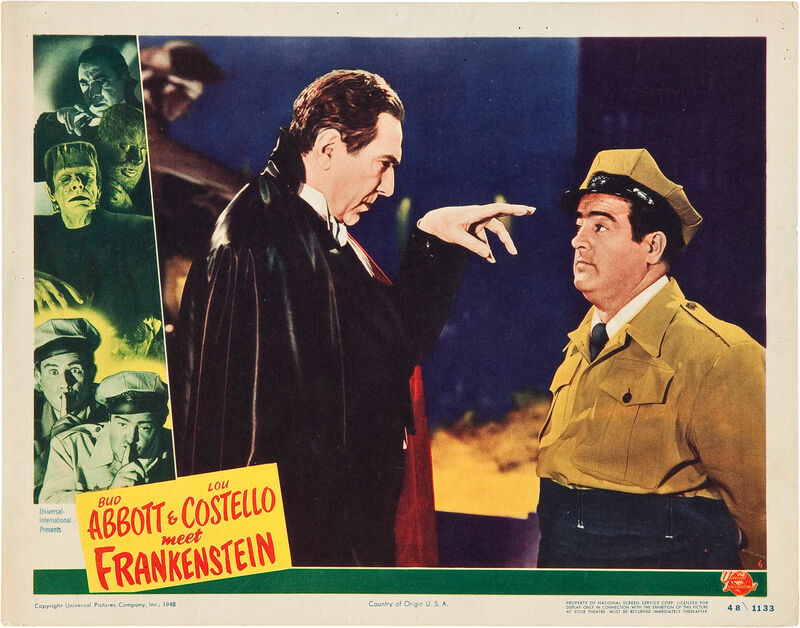 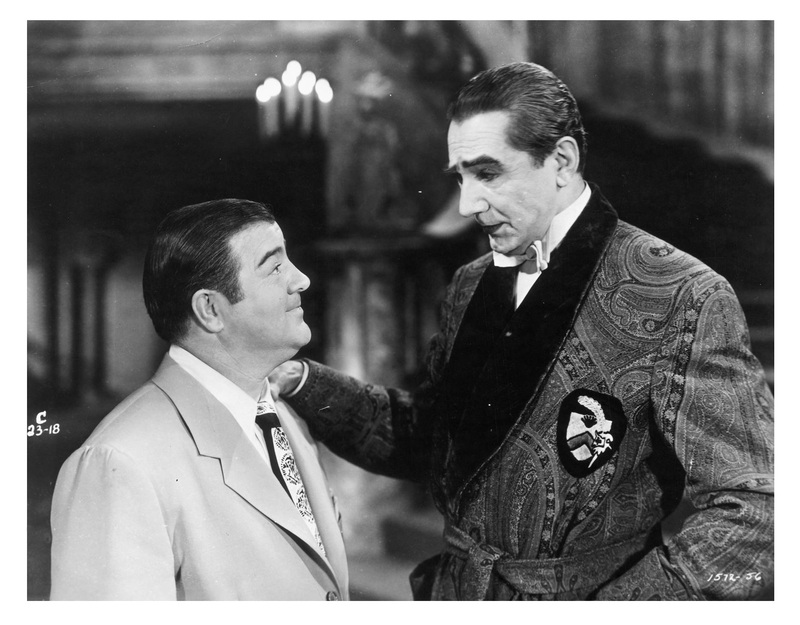 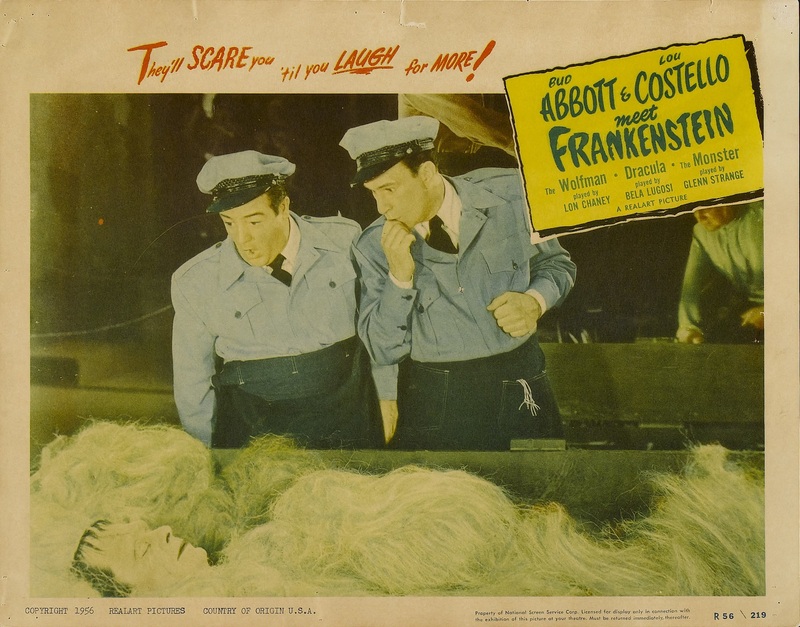 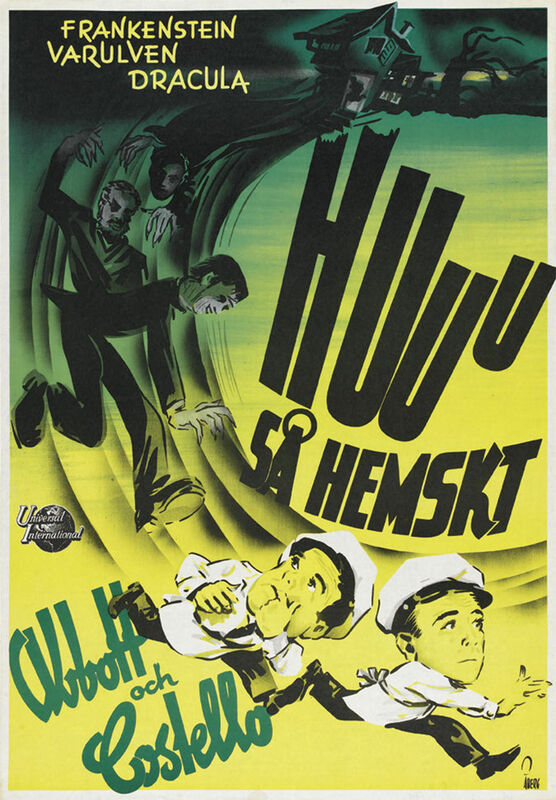 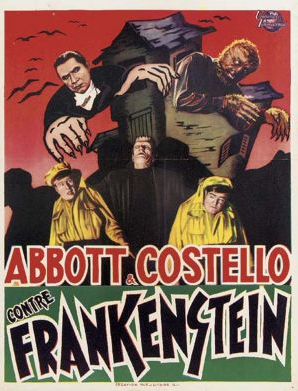 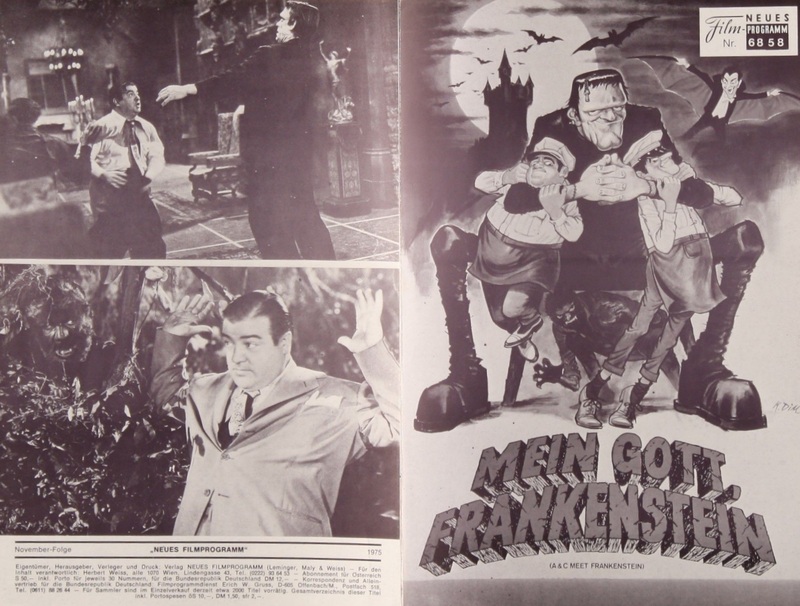 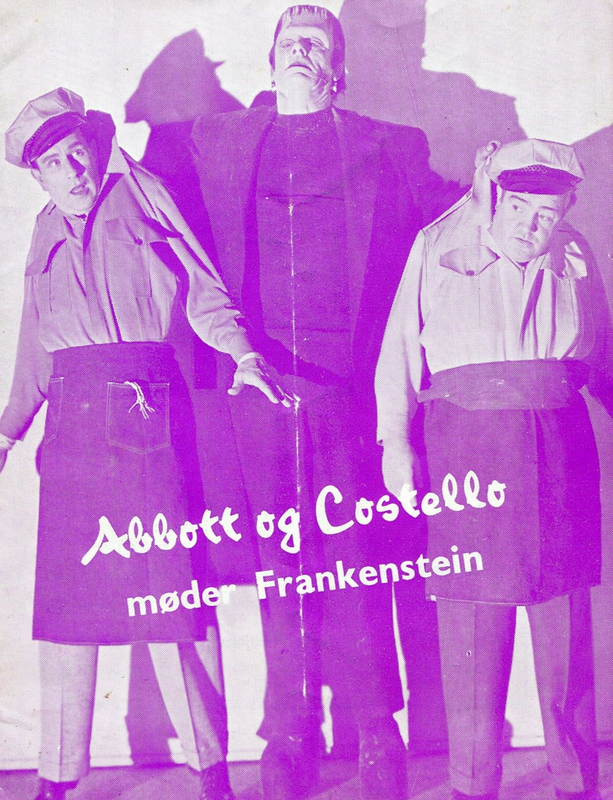 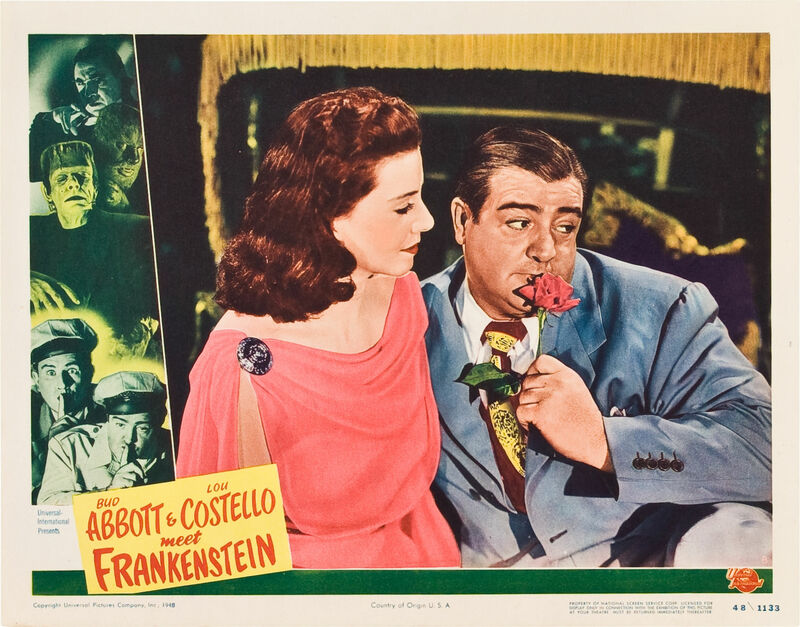 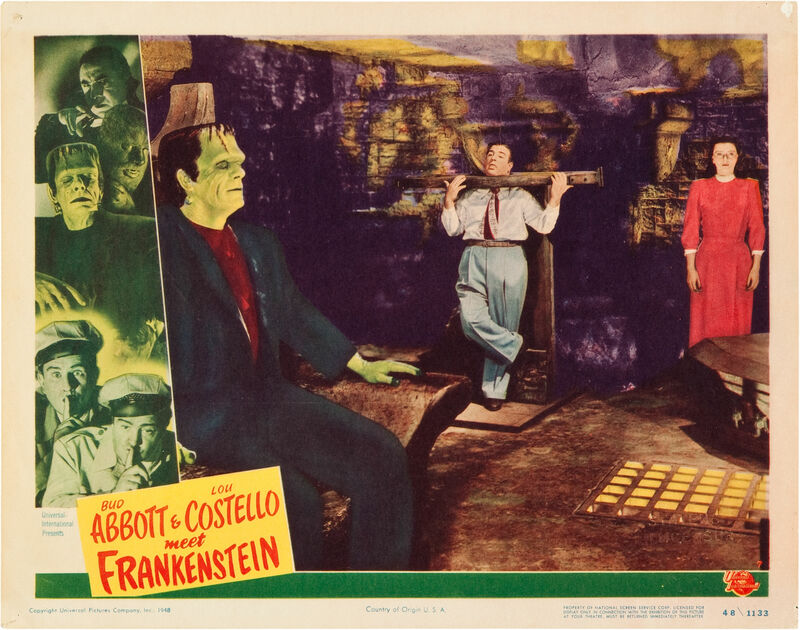 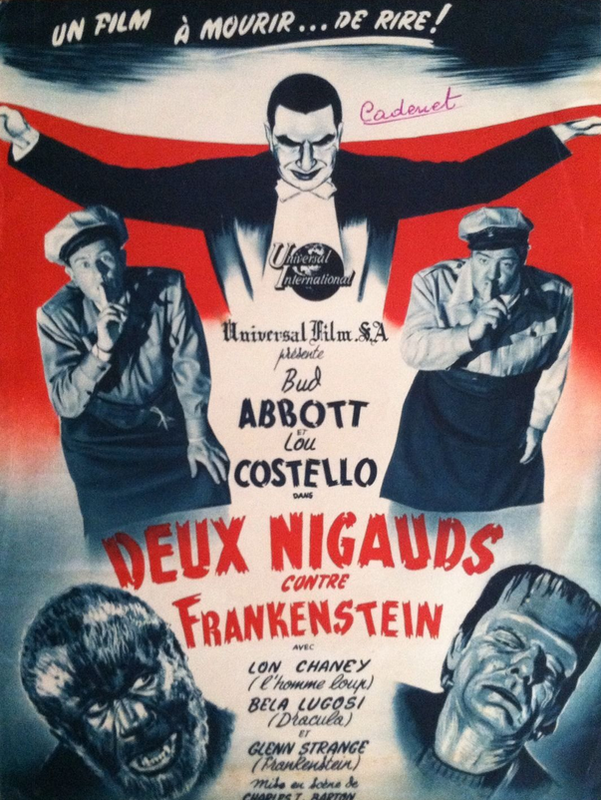 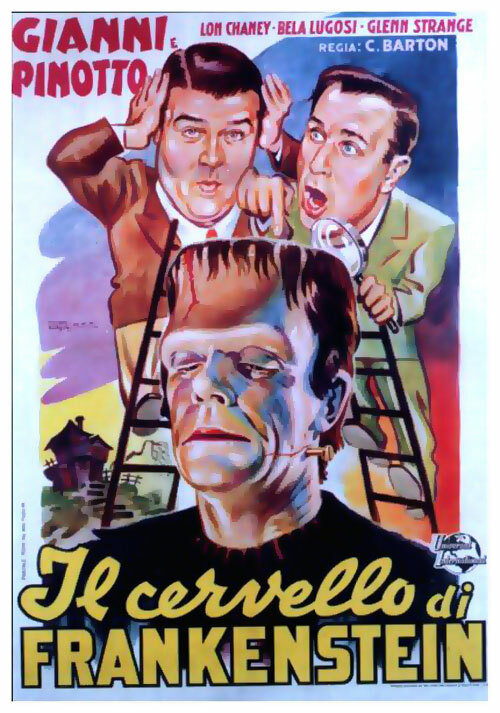 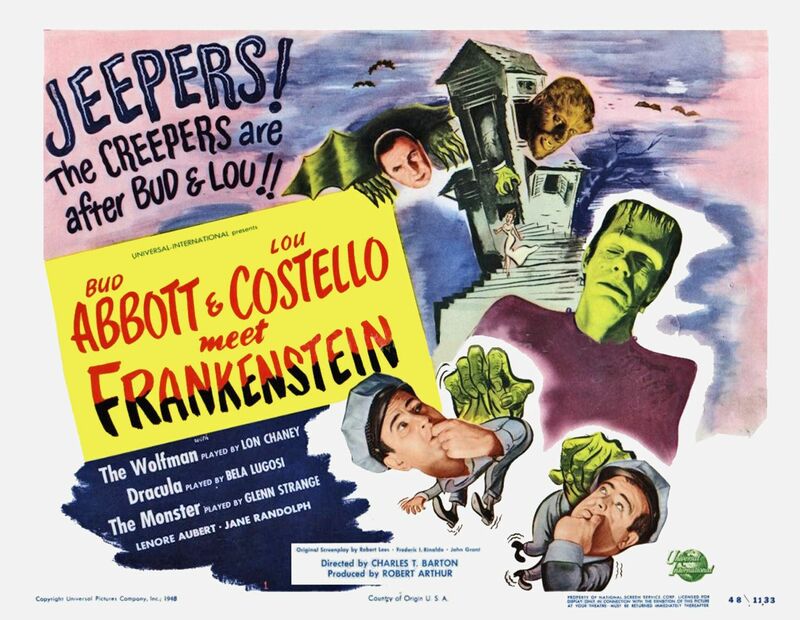 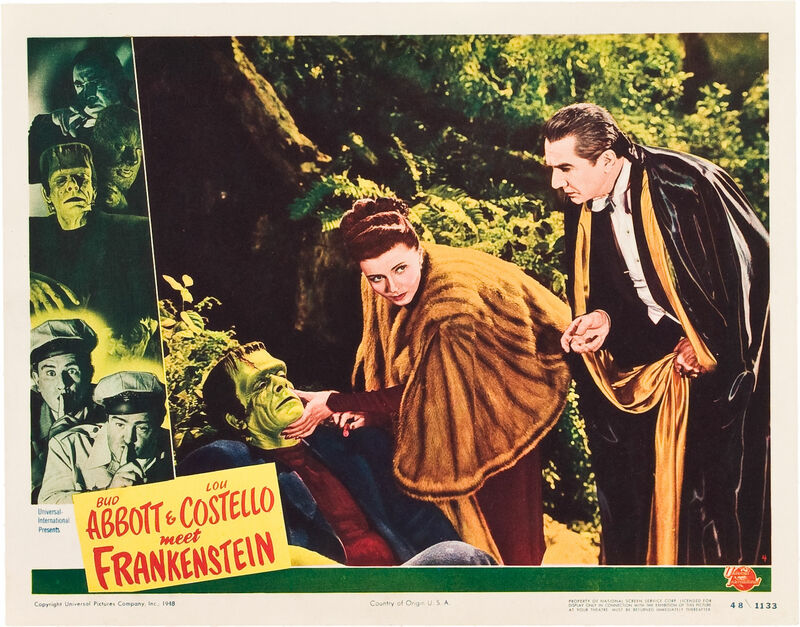 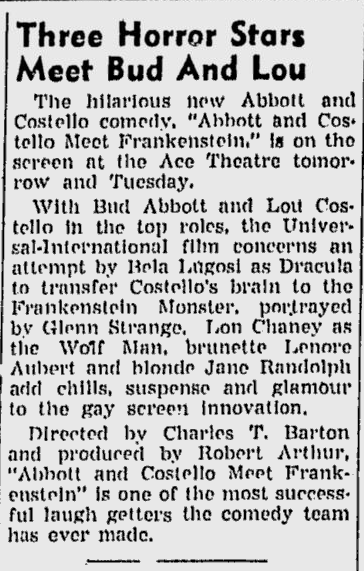 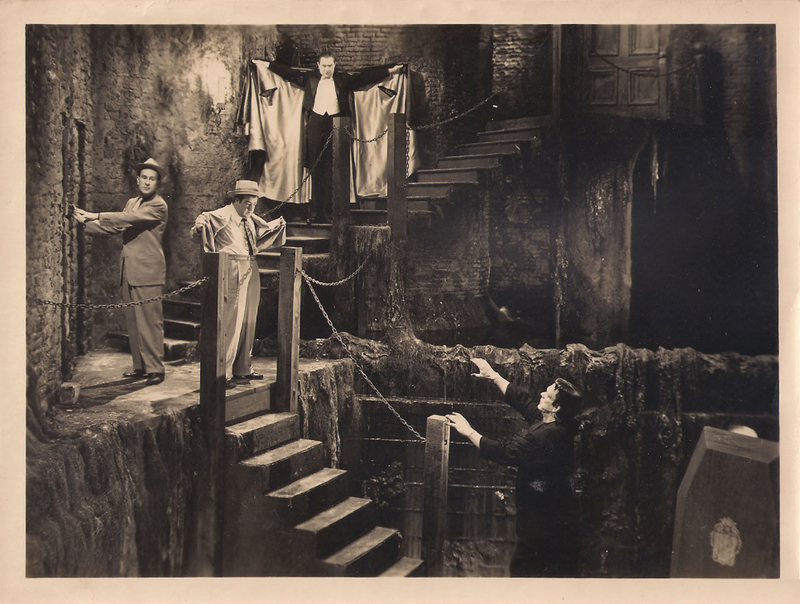 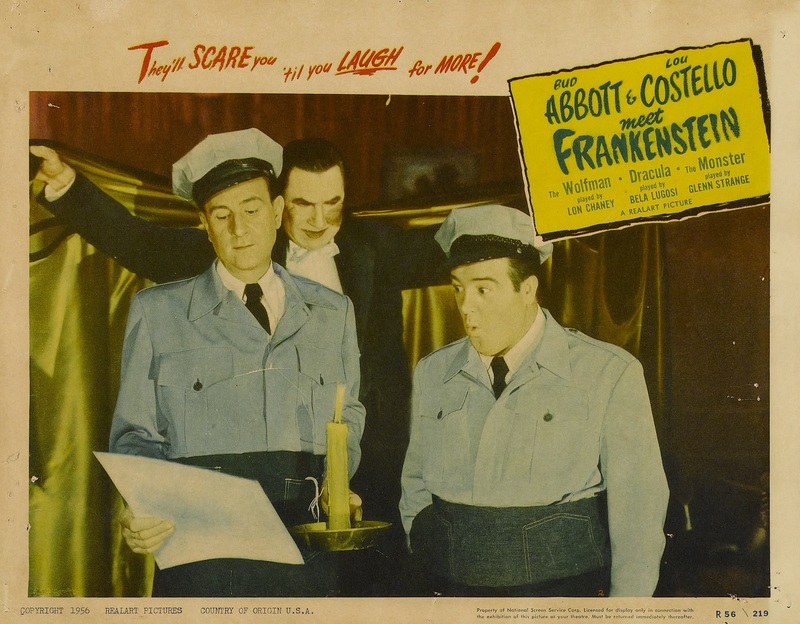 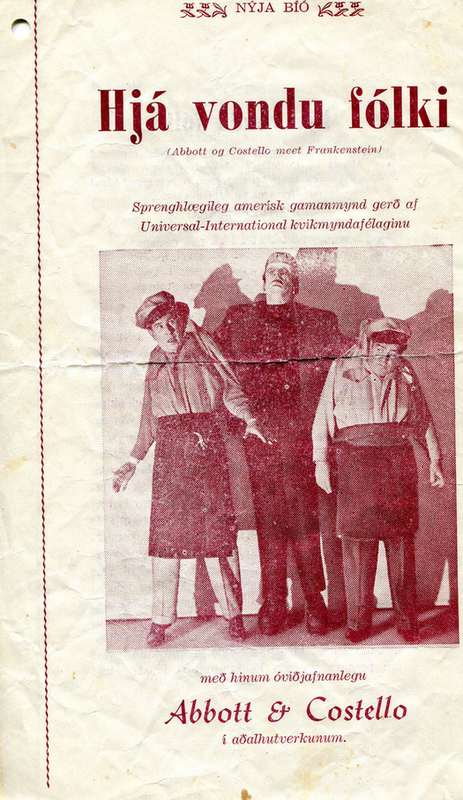 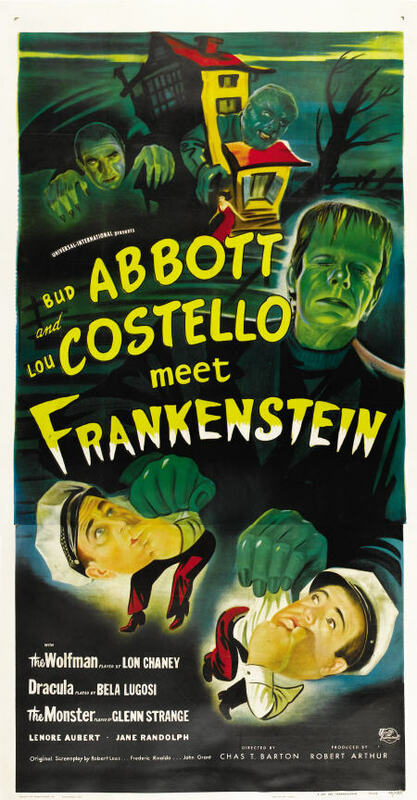 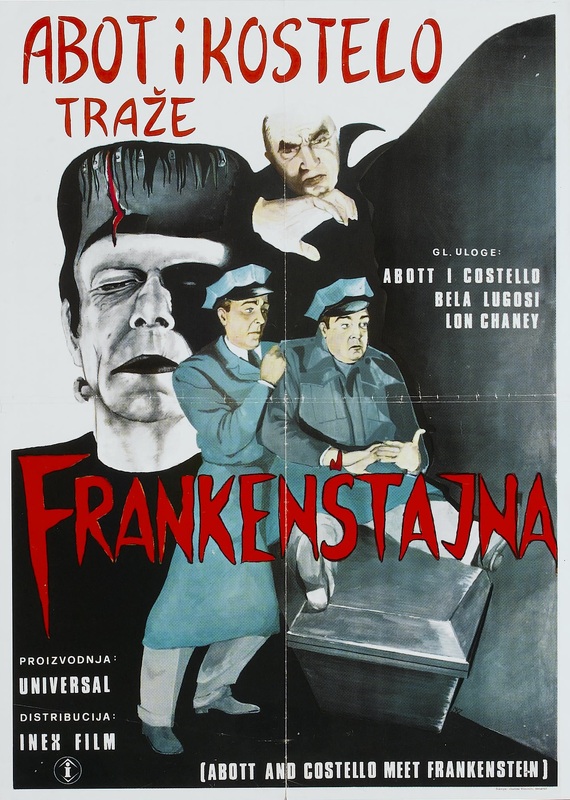 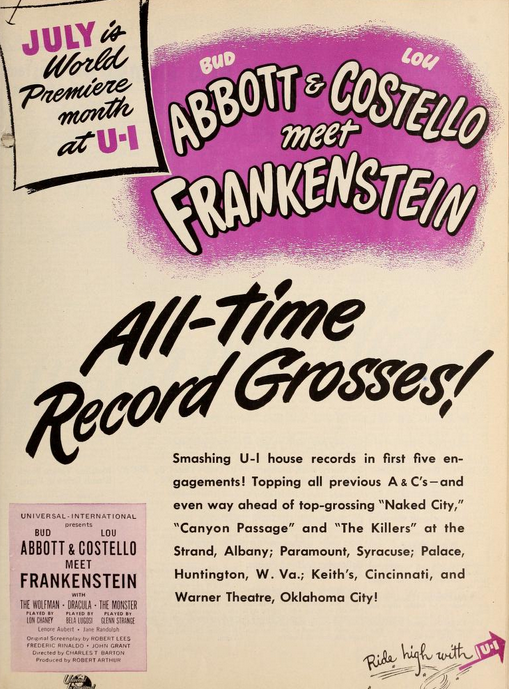 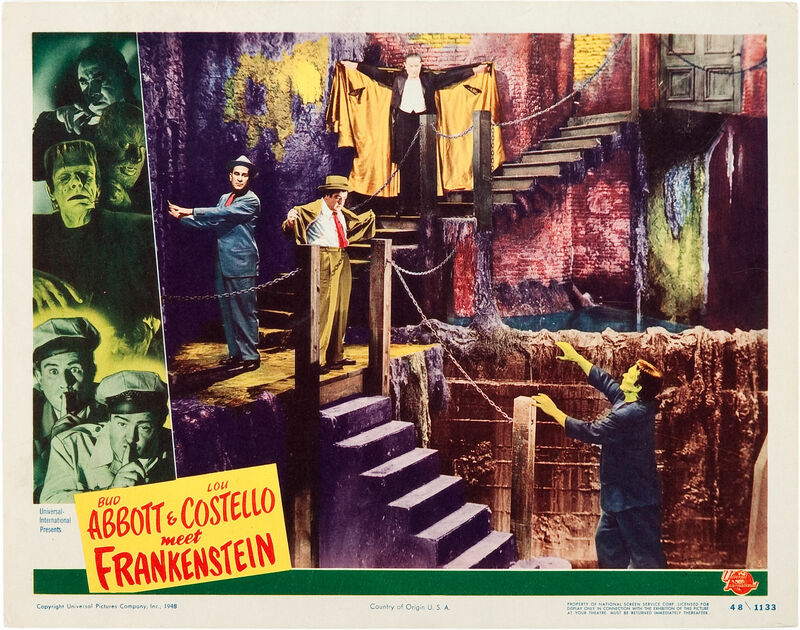 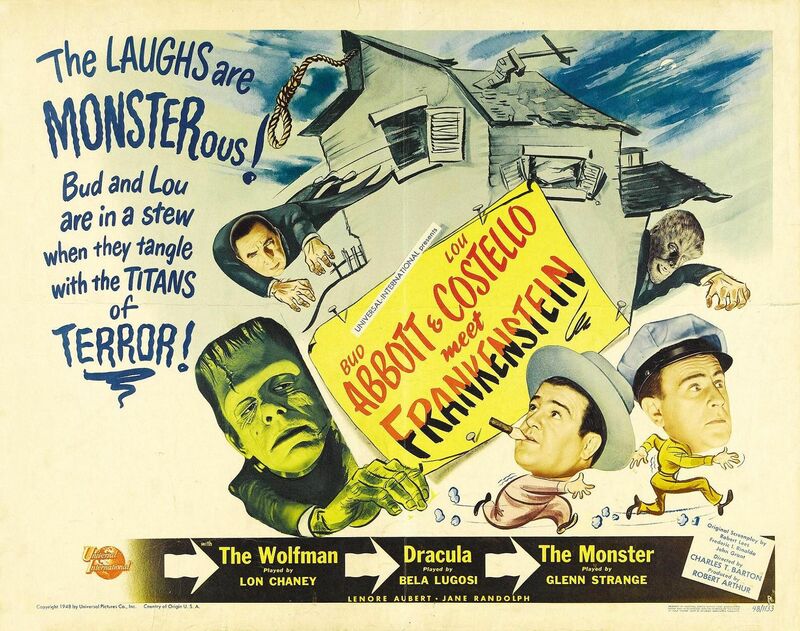 ABBOTT AND COSTELLO MEET FRANKENSTEIN, original screen play by Robert Lees, Frederic I. Rinaldo and John Grant; directed by Charles T. Barton; produced by Robert Arthur for Universal-International Pictures. 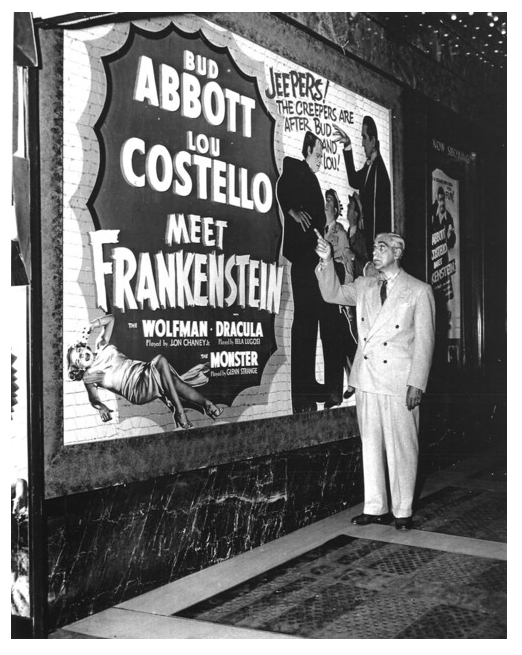 At Loew’s Criterion. 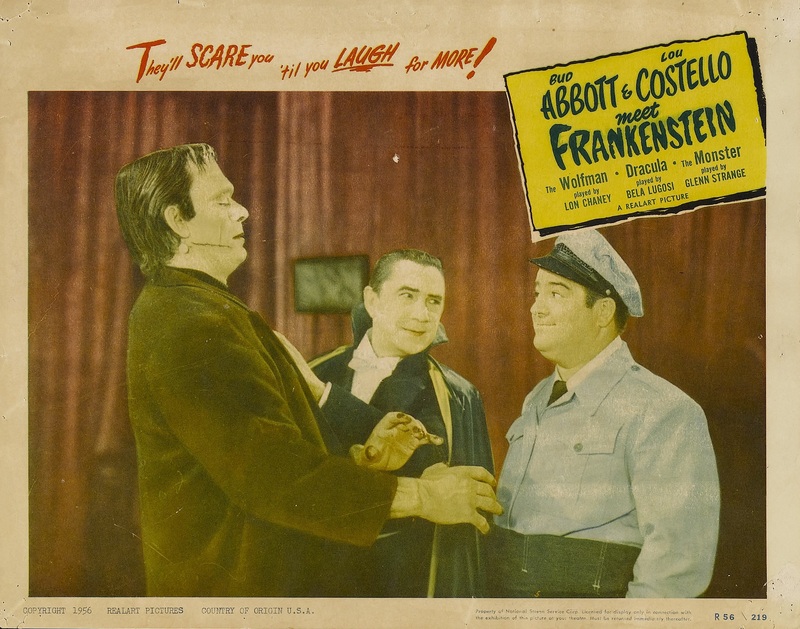 During filming of Abbott & Costello Meet Frankenstein, Wolf Man Chaney, Dracula Lugosi and Monster Strange were barred from the studio commissary during meal times because too many plates of food were returned to the kitchen. 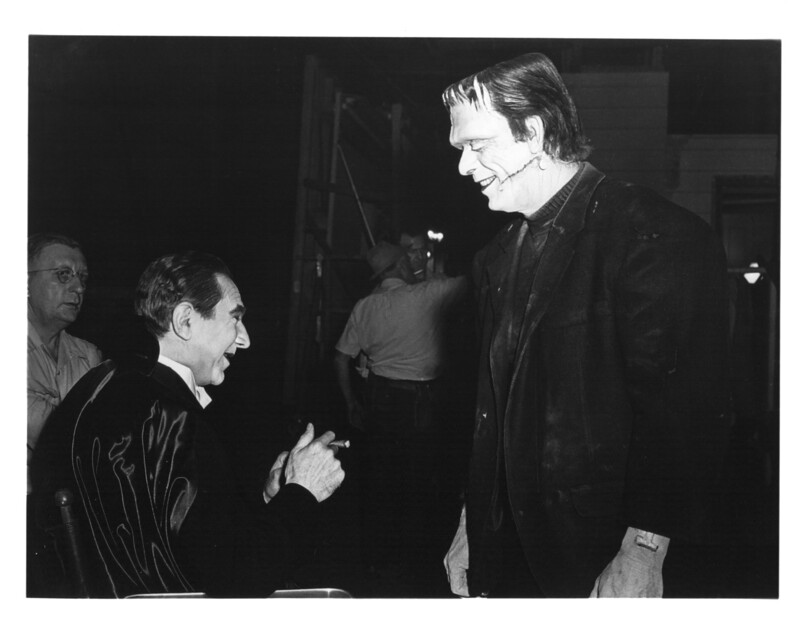 When the new picture started, they all went to the restaurant together, walked in casually, sat down for lunch. 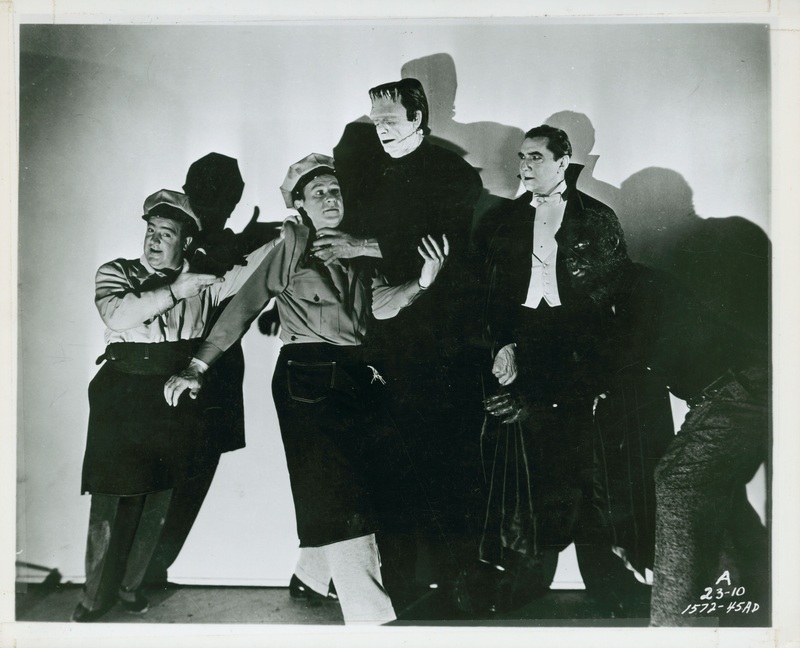 However, studio heads—possibly considering the world food situation as well as the welfare of studio workers—decided the “terrible trio” had to eat in their dressing rooms until production was finished. 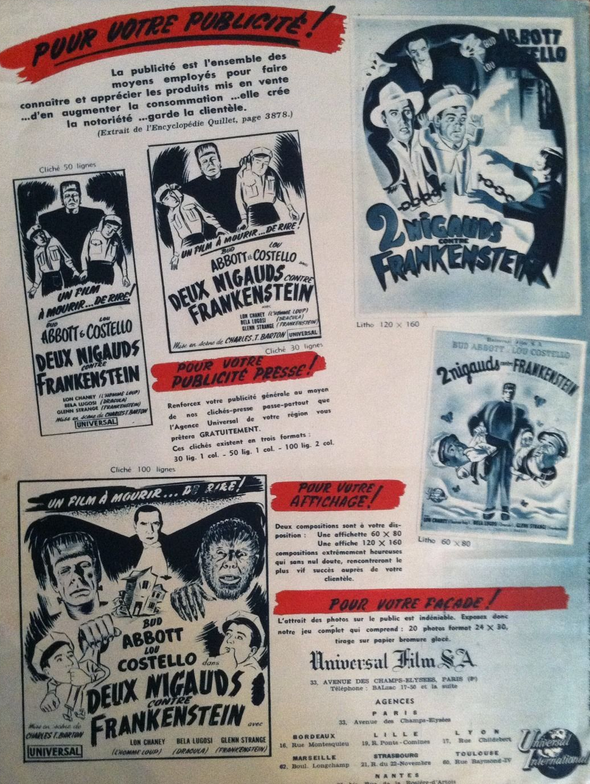 Universal International: rumors that UI are faced with financial difficulties, direct, is traceable to the tendancy of the studio for the experiment using the product of so-called “class”. 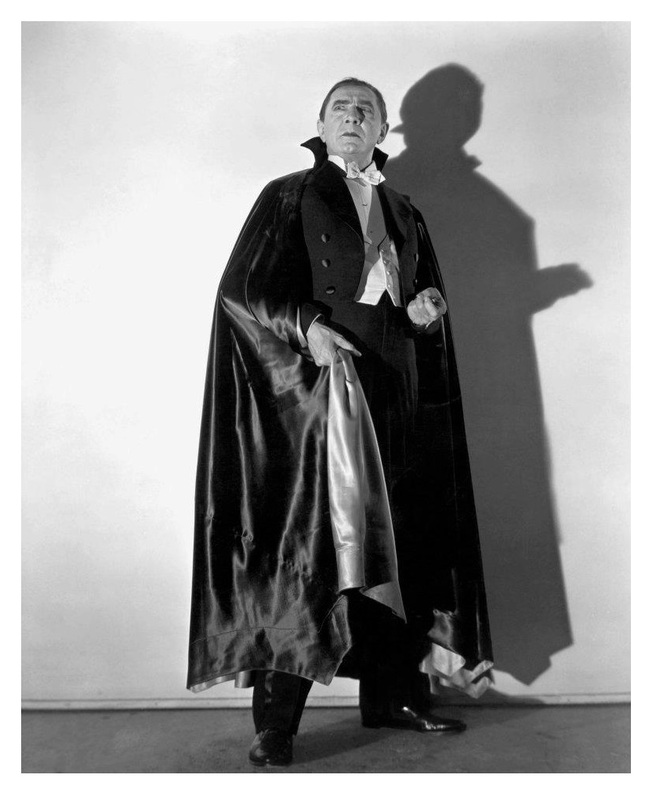 Sales staff would prefer the image of some of the “money” for many of the masses definitely. 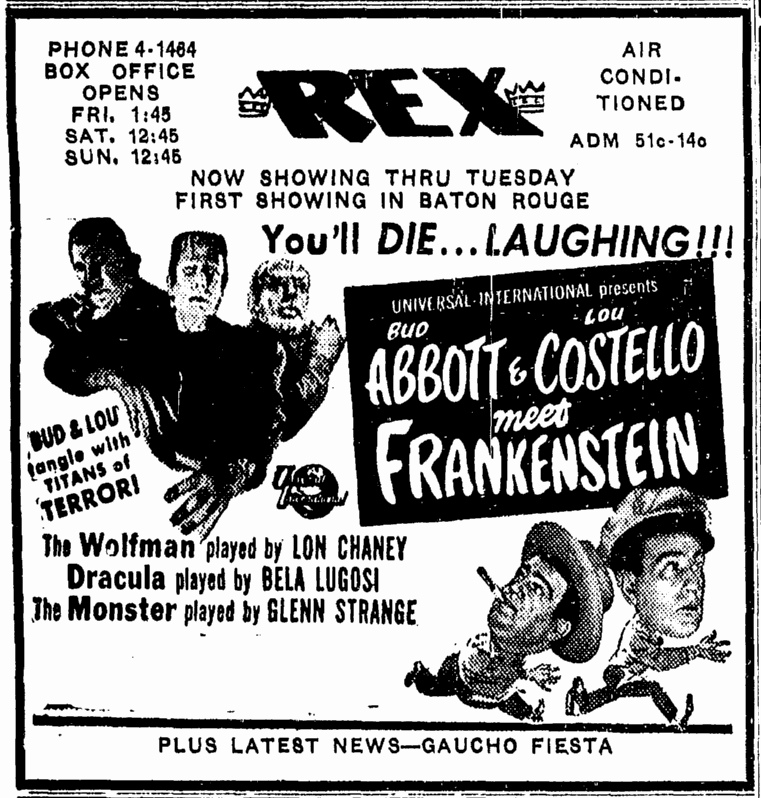 “Abbott and Costello Meet Frankenstein” will probably outside gross elegant “Mr. 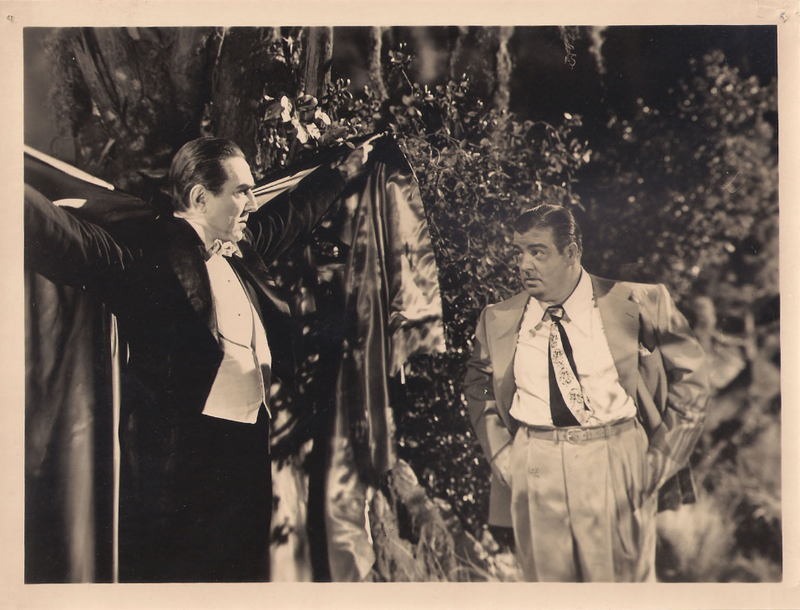 Peabody and the Mermaid“. 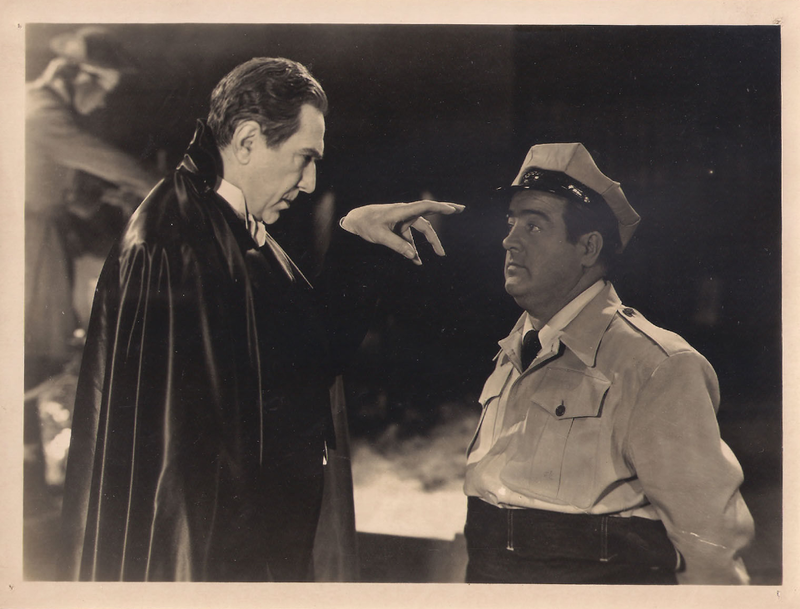 Maybe a change in studio management is in order!